PayPal, the eBay-owned electronic payments company, continues to run into operational issues in India. Earlier this year, the company had to suspend personal payment transactions from and to India, albeit temporarily, when the Reserve Bank Of India (RBI) concluded that PayPal was not in compliance with all relevant regulatory requirements. This morning, an email was sent to Indian users, notifying them that they would (very) soon be removing the ability to withdraw funds from accounts electronically. In an update published on the PayPal blog, the company acknowledges that starting July 29 (in other words, tomorrow), Indian users will only be able to request for a cheque withdrawal of funds from their PayPal accounts. 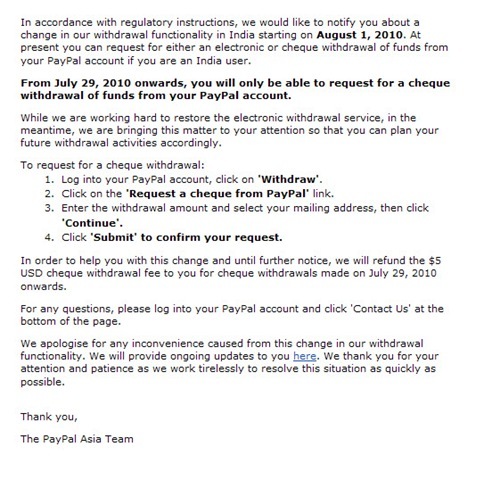 On the bright side, PayPal added that it would be waiving the $5 cheque withdrawal fee from July 29, 2010 onwards, at least “until further notice”. Again, the company cites compliance with regulatory instructions as the reason for the abrupt removal of the electronic withdrawal facility. PayPal does say they’re working to restore the service, and has set up a special website where its users can keep track of further changes, and also find instructions for the cheque withdrawal process. Already, the news has resulted in a flurry of blog posts from Indian users. We’ve contacted PayPal for further comment and will update if warranted.